Earlier this week, Sony and Panasonic touted their new-found partnership -- a joint effort which would focus on mass producing low-cost, high-resolution OLED panels. Today, Panasonic's president Kazuhiro Tsuga clarified the announcement, explaining to journalists that Panasonic does not expect its next generation of OLED televisions to match prices of LCDs for a "considerable time". The take home message? Don't expect to hang up a brand new $300 OLED TV on your wall by the end of 2013. The strategic Sony-Panasonic partnership is the result of pressure being applied by Korean-based electronics manufacturers, LG and Samsung. 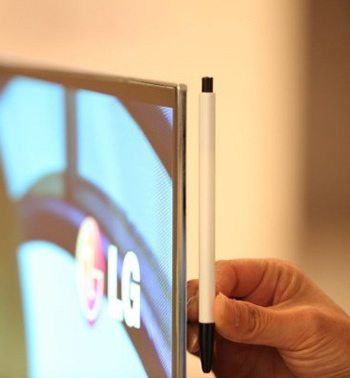 This year, both companies unveiled their own large-screen OLED televisions. Working together, Sony and Panasonic hope to minimize the effects of their head start. Interestingly, Sony pioneered OLED technology. The company actually sold OLED televisions during 2007 and 2008, but halted production after both consumers and industry were spooked by financial uncertainty. Sony's 1080p, 27-inch OLED units sold for around $2000. According to Reuters though, Sony still makes OLED televisions for high-end customers. However, I believe Reuters was referring to Sony's line of professional monitors. A 25-inch model from this line-up costs exactly $26,000 a pop. Certainly, this pricing will have to improve for Sony's OLED offerings to fall into the hands of consumers. OLED screens produce bright, vivid colors without sacrificing deep blacks -- a rather magical combination which has proved challenging for back-lit LCDs. Such panels can also be made impressively thin and even flexible. Despite all the great things to say about OLED though, TVs endowed with the technology will come at an enormous premium -- Both 55-inch OLED offerings from LG and Samsung are expected to weigh in at a whopping $9,000. That's roughly four times the price of most comparable LCD-based products.